I’ve noticed a recent trend in culture towards the co-opting of mindfulness for the for-profit beast of the “wellness” industry. Social media and advertising increasingly paint the picture of mental wellness (particularly for women) as an idealized version of ourselves that stays neutral, calm, and unrattled by the loud emotional experiences around us (with, of course, the permissible exception of a well-timed “messy cry” in the safety of “our tribe”). There’s much truth and kindness there, but also much repackaging for the purpose of creating within us a sense of inadequacy, of doing it wrong, and of need for products/apps/lifestyle-changes/etc to fuel our aspiration towards this version of mental wellness. In this summary of a chapter by Patrick Casement (Chapter 4 from the book Learning from the Patient), we get a different view of what it means to be a good listener: A good listener- whether therapist, parent, or friend- listens with their whole body. Instead of listening to a friend in crisis with a detached calmness or channeling inner zen to maintain a relaxed and confident appearance when our child confesses to seeing or participating in something frightening, maybe what people need is to see that we are impacted. Psychiatrist and parenting expert Dan Siegel, says that through this kind of listening we offer something far more valuable than just the experience of being heard: we offer the experience of “feeling felt.” Feeling felt grows attachment between individuals and fosters the capacity for empathy in both people. When you know yourself, and practice mindful awareness and self-reflection (often facilitated through therapy) you begin to grow aware of your internal baseline. With the awareness of yourself, you can begin to notice how your own emotions or body sensations change in conversations. Often, this internal information can be read as a clue to what might be present but unnamed in the room. 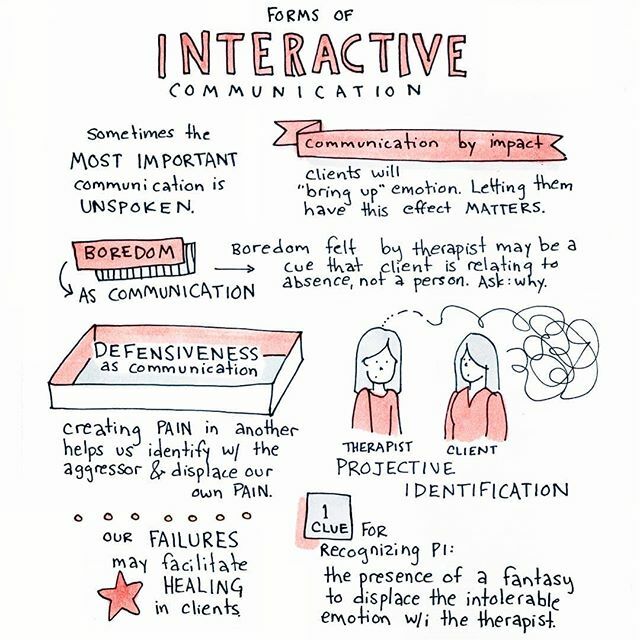 One of Casement’s examples, recorded in this sketchnote, is to consider whether boredom felt in a conversation might be more than just boredom. While many listeners might check out when they begin to feel bored, a listener attentive to how they are being impacted might check in with themselves and wonder if they’re bored because of a dynamic present in the relationship- and an avoidance of being emotionally present to themselves or to their conversation partner. Can Someone Make you Feel Something? Have you ever been corrected for saying “he/she makes me feel so ____!”? Often, when we teach kids communication skills, we remind them that “no one can make you feel something!” But that’s true and not true, when it comes to relational psychology. While we now know that brains in relationship actually are able to evoke emotions in another via mirror neurons, we still are tasked with filtering those experiences through our own brain- which is why it is essential to do our own work to become increasingly self-aware of our own beliefs, assumptions, and biases. This psychology sketchnote is available as a printable PDF on my Patreon.